Not seeing much recently on this site for skiing, I thought I’d provide some ski condition update for Saratoga & S Warren County. The good news is that with the few inches before Christmas (later settled by rain & cold), plus the 6-8” ending on Christmas day, many local spots have good skiing – and are free. For the skinny ski fans – including 2 of my daughters - Cole’s Woods (off exit 19, near Crandall Park & the YMCA in Queensbury) has groomed the 5K loop for both skating & classic style. Conditions Wed 12/29 were very good except for some downed pine cones & tree debris. They have a lighted trail for night. Park behind Inside Edge ski shop on Rt 9. The Lake George Recreation area (W of exit 21 near transfer station) had good cover & ski (or SS) tracks on most of its trails as of Tues 12/28. The trail up the W side of the mountain 200 yds after the first bridge was rough & water flowing – so not attractive yet. No grooming here (that I’ve ever seen). Wilton Preserve (off exit 16) was skiable before Christmas and had been rolled. Surely good snow there now. Not extensive nor any real hills, but nice to get out. With the local snow & verrrrry cold temps, I haven’t needed to drive any further yet. Skied the XC trails at Prospect Mtn (E of Bennington) the week before Christmas. They had great snow, and continue to have equal or more snow than other ADK locations other than Tug Hill. There, Lapland Lake & Garnet Hill are common destinations for groomed skiing - with a fee of course. N toward Lake Placid finally got more snow, with good conditions reports periodically posted here: http://www.jackrabbittrail.org/conditions . Paul Smiths appears to have had the most reliable snow before the Christmas storm. Enjoy winter! Any reports from ADK trails? Botheration?, Hoffman notch?, Pharaoh Lake? Jackrabbit in Keen was beautiful on Christmas day. Today, the Jackrabbit south of 86 in Easy Street was good with only a couple of others out before me. Plenty of snow around Paul Smiths.....the VIC is probably skiing good. The Little Green Pond and Fish Pond truck trail were good before Christmas. Heading there tomorrow. We were at Rogers Rock yesterday, and the x-country trails there looked to be in great shape. Well groomed and nicely packed. Skied at Cascade Ski Center on Saturday 12/30 and had a great time. Plenty of snow and tracks set most places. New Years Eve I skied the Connery Pond/Whiteface Landing trail. I only went about 2 miles in, not all the way to the landing, due to a blister on my foot from the day before. Plenty of snow there as well. Had a blast on the hills coming back out. 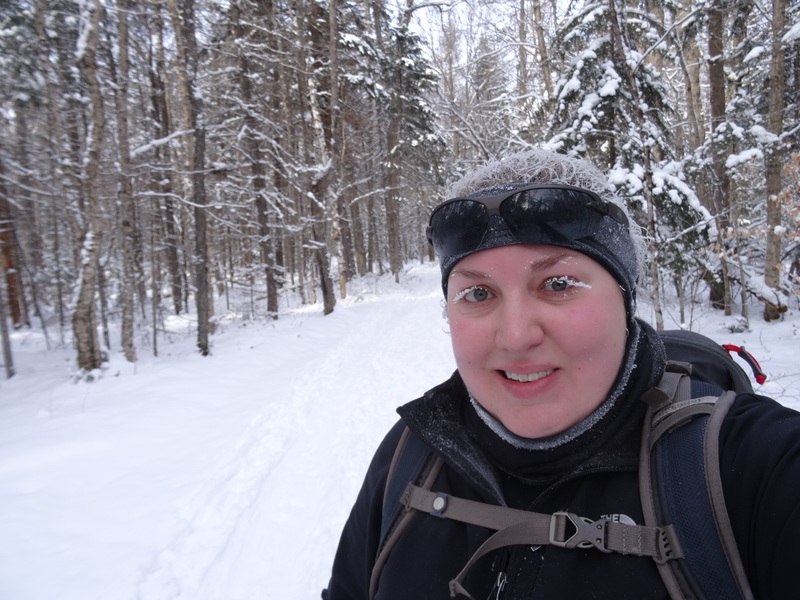 There were lots of people out skiing and snowshoeing the trail even with the negative temperatures. I have never experienced such frosty eyelashes! Skied in the Cat & Thomas mtn area yesterday. About a foot of settled snow in woods with packed trail - all powder. Ski conditions on flat & gentle slopes very good with ability to ski out of the packed track into the deeper powder (no crust). Some separate ski tracks on the rise from Edgecomb pond. Not enough snow for me to try the steeper sections on Cat above the first re-route. I'd guess at least 6" more needed for that. Saw only a few others (2 boot & 2 SS). Trail between Cat & Thomas well packed by SS & OK skiing, no separate ski track. Was told 10-12" in Brant Lake area & likely possible to ski into Pharaoh from S. Current snowfall will really help over the good cold base we have now. I've been skiing locally (Clifton Park) and will surely be out on the new snow tomorrow. Skied Fish Pond trail area today. The base survived the two days of rain and warm weather. Up to a foot of fresh powder. Great conditions! Nice conditions on the trails around these two ponds today. Well broken out and fast. I ran into "Connecticut Yankee" and his setter at the parking area.....nice meeting you John! This past Monday we hit the Raquette Falls trail and had awesome conditions there also.